Roland EGX-400 engraving machine has the power, size, and speed required of today’s professional engravers. The Roland EGX-400 engraver makes it fast and easy to engrave on a wide variety of materials, including: plastic, acrylic, aluminum, brass, urethane foam, and even wood. In addition to personalized awards, corporate crests, and promotional items, the Roland EGX-400 engraving machine is capable of producing quality indoor and ADA compliant signage. Your signs will benefit from an upscale look while maintaining all ADA signage regulations. The Roland EGX-400 owes its impressive speed and quality to both servo motors and Feed Forward Processing (FFP). Servo motors produce high levels of torque for smooth, fast engraving; while FFP (look ahead) technology will anticipate the tool path ahead of time creating greater accuracy and energy efficiency. The industry-first combination of FFP, belt drives, and digital AC Servo (DAC) brushless motors on the X, Y and Z axis results in unmatched precision, speed, and reliability. In addition to faster cutting, the high-speed spindle and brushless DC motor produces increased torque with less vibration. Roland EGX-400 engraving machine has an engraving speed of 100mm/sec. and a maximum spindle speed of 30,000 RPM. With these features, it’s no wonder more professional engravers choose the Roland EGX-400 engraving machine over any other. With the Roland EGX-400 engraving machine, you don’t even need a computer present to do any engraving. The Roland EGX-400 comes with a removable MMC memory card that can store files programmed on your computer and then be inserted directly into the Roland EGX-400 without the use of a computer. Make your projects mobile or create them from virtually any computer for easy production later. 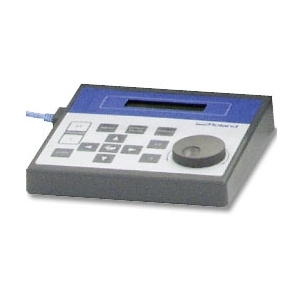 The Roland EGX-400 engraver comes with a hand-held control panel which can be extended away from the machine. The control panel allows you to start and pause a job from a safe distance, and incorporates a jog dial for adjusting the spindle speed or making menu changes on the fly. A separate teaching feature allows you to send operating commands directly from the control panel to the Roland EGX-400 engraver, also without the use of a computer. Roland EGX-400 engraving machine comes equip with a large 16” x 12” workable surface area to accommodate multiple items at once. For fast and simple setup, an automatic surface detector determines Z-zero when the tip of the nose guard touches the material surface. 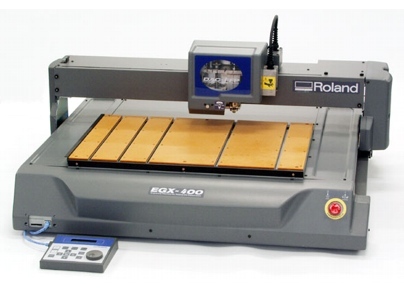 The Roland EGX-400 employs a gantry X-axis rail and flat table system which accommodates endless lengths when engraving long boards for larger signs. The T-slot, Bakelite table can be surfaced for ultra-precise engraving and can be removed easily when using jigs, vises, or larger materials. If you really want to boost up your production, you can connect multiple Roland EGX-400 engravers together with Roland’s sequence I/O controller. Production line engraving has never been easier. I bought the EGX-600 last December from this company and I could not have been any happier! Danny and Jessy gave me an amazing price! They educated me about the machine before I bought it, and they promised to help me when I had any questions, and they surely did keep their promise.I have never had a single problem or concern with their service, and they help me to their fullest potential. They send links and pictures and samples in case I need it. I would recommend them to anyone 100%! We are very pleased with the EGX-400. It is performing to our expectations and easy to use. Danny Martinez was extremely helpful in helping me get it installed and set up. My only complaint was with the vacuum and the software help line. All in all a pleasant experience. We purchased the EGX-400 for label making and signs around our plant site. We are very happy with this purchase and the support that we have received in setting up the machine. We produce lableling and signage for the Construction and Data Center Industries, and the EGX-400 is perfect for our business. Danny from EMP has helped us every step of the way and continues to provide support whenever we need it. I highly recommend EMP (and Danny) to anyone interested in purchasing an engraving machine. I like this machine. It takes me a little to remember how to do everything because this machine can do so much. I have called in to get some assistance and Danny was great. I would recommend this to anyone interested in purchasing some thing like this. We purchased a Roland EGX-400 to produce our trailer VIN tags. We were outsourcing these at a cost over $13 ea. We now produce them with a material cost of $3 and 1 minute of labor per tag. The machine will pay for itself in less than 6 months. The installation, training, and on-going support have been fantastic.